Stellar, a Jacksonville-based design, engineering, construction and mechanical services firm, is now developing modular renewable energy systems that will convert waste to energy. Stellar, which is consistently ranked by Engineering News-Record magazine as one of the nation’s leading green designers and contractors, will construct the systems at its prefabrication facility in Jacksonville. The new systems will serve clients in a range of industries, including waste management and wastewater treatment; food and beverage processing; agricultural (dairy, meat, poultry and crop farms); petrochemical, bio-fuel refining, coal mining; and pharmaceutical and bioscience. These industries produce organic waste such as sludge from wastewater treatment plants, animal waste from meat processing facilities, manure and silage from agricultural sites, and food waste from food processing plants. Instead of traditional waste management and disposal methods, the new systems enable this waste to be converted into energy. For example, landfill sites generate biogases (mostly consisting of methane) as the waste buried in them undergoes the natural process of anaerobic digestion, or the breakdown of organic material in the absence of oxygen. If this gas is not harvested (through a renewable energy system such as Stellar’s), it escapes into the atmosphere and can be 20 times more potent and harmful to the environment than carbon dioxide. Pending U.S. legislation (both federal and state) and international protocols, such as the Kyoto Protocol, will soon dictate more restrictive emission rates and expanded renewable energy requirements for manufacturers and other producers, who will see the financial impact of these climate change policies if they do not implement renewable solutions. These financial impacts include higher energy rates and waste disposal costs as well as growing consumer awareness of whether or not a company has “green” energy programs. To transform waste into energy, the waste must be pre-treated, separated and stored in enclosed tanks (called anaerobic digesters) that decompose and break down organic matter by excluding oxygen (this process is called anaerobic digestion), thus producing a biogas. The biogas is then combusted (burned) in an engine to generate electricity, heating and cooling. The electricity produced through this process can be used by the producer (as well as the heating and cooling), sold to a nearby facility or redistributed to a nearby electrical grid. Stellar will work closely with customers to design, supply and install these biogas renewable energy systems. The new biogas systems are modular – instead of building the systems on-site, they are constructed and engineered at Stellar’s 60,000-square-foot fabrication facility in Jacksonville, Fla., and then transported to the site. Modular products enable greater flexibility, consistent high-quality standards, compressed project schedules and long-term reliability. The modular systems will be pre-tested before arriving onsite, thus minimizing site impact during installation and commissioning. A shortened construction schedule enables opportunities for lower project cost. Stellar offers a range of modular products, including modular chiller plants, which are energy plants that provide cold water for air conditioning. Stellar has assembled a comprehensive team to offer the biogas systems. Stellar will provide design, construction and project management services, self-performing all work in its fabrication shop for modules that contain control systems, cogeneration equipment, compressors, flares and electrical equipment. Stellar will rely on partners for specialized services: Ring Power Corporation, the authorized Caterpillar dealer for North and Central Florida, will serve as the key equipment supplier for the electric power generation, providing the gas engine generator set products, generator control and paralleling switchgear, 24-hour emergency repair and comprehensive preventative maintenance programs. And, Energenic (www.energenic-us.com) will provide third-party ownership and operations management, specialty metering and engineering services for feasibility analysis. Phoenix Products, a division of Ring Power Corporation, announces the acquisition of the assets of the former Power Generation and Engineering, Inc. (PGEI) located in Oakdale, California. Bruce Pierce, Phoenix Products manufacturing engineer, will transfer from the Phoenix division headquarters in Jacksonville, Fla. to manage the staff at the existing production facility located at 736 Wakefield Court in Oakdale, California. Phoenix Products will continue to provide the quality products and services that West Coast customers have come to expect, and will leverage the skills and capabilities of the former PGEI employees to ensure this goal. Ring Power Corporation and the Phoenix Products division will work with all current West Coast customers to meet existing and ongoing project requirements in a timely, cost effective manner, with an eye to developing mutually beneficial business relationships for the future. Entertainment Services had the honor to provide power to the annual art installation, "Tribute in Light." 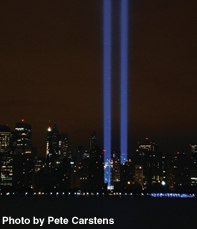 Staged at the World Trade Center, the work is comprised of 88 searchlights that create two vertical columns of light to represent the two fallen towers. Originally lit March 11, 2002—six months after the attack—the display ran until April 14 of that year. The project was launched again September 11, 2003 to mark the second anniversary of the attack, and has been done every year since. It stays lit from dusk to dawn and can be seen from over 60 miles away. Michael Ahern Production Services (MAPS), a long-time client of ES Northeast Regional Manager Steve Jackson, had been using a competitor to power it up. When the competitor was bought out, MAPS turned to Entertainment Services for the solution. On September 4, New Jersey Entertainment technicians Jason Kolterjahn and Dennis Crespo reported to Ground Zero in New York City to install the power units for the event. The setup included two 1250 kW generators, eight 300 kVA transformers, one 2400 amp standing section, 15,000 feet of 4/0 cable and an extensive rigging package to bring cables up to the top of parking structure. Entertainment Services is committed to conducting business in an environmentally responsible and conscientious manner. We utilize renewable energy sources wherever and whenever practical to reduce our carbon footprint, and we engineer safety into all of our products to reduce the risk of injury or damage to the environment. 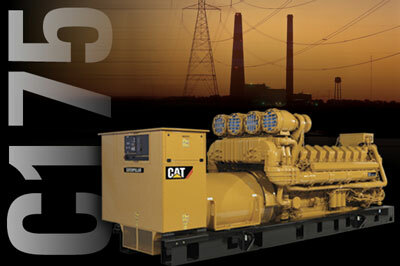 Our generator set engines are emissions-certified and meet all EPA standards. Our sound attenuated enclosures, fuel tanks and other specialized products are designed with UL-listed components according to stringent production standards to ensure safe fluid containment and reduced noise levels. For years Entertainment Services has offered bio-diesel as an alternative to our clients in the entertainment industry. To limit our carbon footprint even further, while still delivering dependable power, we are alos developing a production technology that uses house power during pre-production, with a seamless transfer to generator power on show days. Our environmental philosophy is in alignment with Caterpillar’s market-based approach to the aggressive development of current and future clean technologies that reduce emissions and sustain the environment. In summary, Entertainment Services strives to conserve natural resources; reduce waste through emissions technology, recycling and the safe disposal of consumable items; and by example, we encourage our business partners and customers to do the same. As of January 2008, Orlando Rock, a site development company that has been serving the community since 1984 on municipal, retail, commercial and industrial projects, successfully completed the conversion of their entire fleet of heavy equipment and on-road vehicles to a soy-based, bio-diesel fuel. This environmentally conscious change will save 32,000 gallons of diesel per year, complementing Orange County and the City of Orlando’s efforts to “go green”. The bio-diesel fuel Orlando Rock is using is a blend of soy-based fuel and fossil fuel. 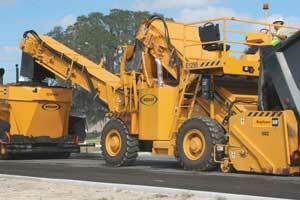 Certain Caterpillar® machines are capable of handling a B35 blend, which contains 35% soy fuel. The majority of Orlando Rock’s fleet was only cleared for a 20% blend, so they chose to use B20, or 20% soy fuel in all of their machines. Because the mixed fuel burns cleaner and loosens buildup in the engine, all 45 pieces of equipment had to be slowly converted over to the B20 blend, but no modifications had to be made to the equipment engines. Starting with a 5% blend in October 2007, Ring Power completed oil samples every 100 hours on a control group of machines to ensure there were no problems. The lab monitored changes in oil viscosity and soot levels to determine at what point the engines could be stepped up to the next blend percentage. Initially it was thought the conversion process would take a little over a month, but safe conversion of all the machines and on-road vehicles was completed in three months. The biggest challenge for Orlando Rock was the cost commitment. After weighing the cost of the custom blended fuel against the knowledge that the conversion helps increase the longevity of the machines in the fleet, decrease air pollution and diminish reliance on foreign oil, Orlando Rock decided the switch was worth the cost. “People think to switch to bio-diesel you have to modify your equipment and switch over your machines and really, you don’t. It’s a matter of changing your attitude more than changing your equipment. People who burn cooking oil have to modify their machines to run on that, but straight bio-diesel isn’t as complicated,” said Scott Altman, president of Orlando Rock. Around the same time as Orlando Rock began their conversion process, the City of Orlando kicked off “Green Works Orlando,” an environmental program designed to raise awareness and promote ecologically friendly solutions for all city services and functions. Also, in late September 2007, Orange County Mayor Rich Crotty held an “Orange to Green Climate Change Summit”, attended by Florida Governor Charlie Crist. Upon hearing about Orlando Rock’s proactive environmental efforts, Mayor Crotty met with Altman in October to congratulate him, holding a ribbon cutting ceremony to commemorate Orlando Rock’s green initiatives. A key pillar of Green Works Orlando is the goal of designing all the city buildings to meet with Leadership in Energy and Environmental Design standards. Developed by the U.S. Green Building Council, the LEED Green Building Rating System provides a suite of standards for environmentally sustainable construction. Altman and his employees will soon complete their LEED certification, and will receive bonus points toward their goal for the use of bio-diesel fuel. Altman and Orlando Rock intend to use the knowledge gained from the conversion of their fleet and their certification to encourage other local contractors and subcontractors in the Orlando area to become LEED certified, helping his county and city to achieve the goal of going green. Contact your Ring Power PSSR or service manager regarding switching your equipment to bio-fuel. For more information about LEED certification visit the US Green Building Council at usgbc.gov. You can contact Orlando Rock at 407.859.5990 or scott@orlandorock.com. With rising demand for electricity, ever-tightening emissions standards, evolving technologies and space at a premium, your challenges as an operator continually grow. It starts with ACERT™ Technology. Many of the C175 advantages begin with the use of ground breaking ACERT Technology, that combines advancements in electronics, air management, and fuel delivery to improve engine response and fuel efficiency, plus lower NOx emissions. With ACERT™ Technology this new family of generator sets combines high power density with efficient operation and low emissions. In a wide variety of standby applications—commercial, institutional, industrial, utilities and more—the C175 family delivers cost-effective power in a small, highly versatile package, with reliability, durability and performance you expect from Caterpillar. *Currently only 3 MW generator is available. With today’s demands on production equipment, safety is critical. One item that is often overlooked with forklifts are the forks themselves. ANSI B56.ie1993-6.2.8. requires that "Forks in use shall be inspected at intervals of not more than 12 months, for single shift operations, or whenever any defect or permanent deformation is detected. Sever applications will require more frequent inspections." ANSI B56.ie1993-6.2.8. states: "Repair by only the manufacturer of the fork or an expert of equal competence shall decide if a fork may be repaired for continual use, and the repairs shall be carried out by such parties. It is recommended that the surface cracks or wear be repaired by welding. When repairs necessitating resetting are required, the fork shall subsequently be subjected to an appropriate heat treatment, as necessary." For more information or an inspection of your lift trucks' forks, contact Ring Power Lift Trucks or contact us at lifttrucks.ringpower.com. Safety is often viewed as an expense with little return on investment. In actuality, safety focused companies enjoy extreme savings and a market advantage over their competition. Well-managed safety programs are key catalysts driving your organization to exceed typical safety success factors. 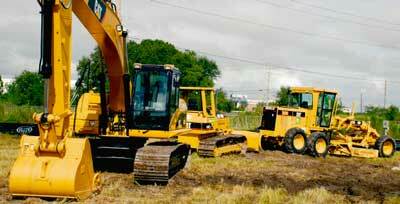 Safety awareness training coupled with owning and operating Caterpillar® equipment builds your road to achievement. Ring Power’s Rings of Safety®, in conjunction with Caterpillar, is the industry leader in providing the safest, most reliable products, maintenance and practices. Customer expectations are consistently exceeded by Ring Power’s professional commitment in partnering to walk every safety mile together. We are a team! For everyone working with, around and on Caterpillar equipment, we all share the same goal: to return home to our families safely everyday. This primary motivating factor fuels our journey to a safe work environment, every minute of every day. 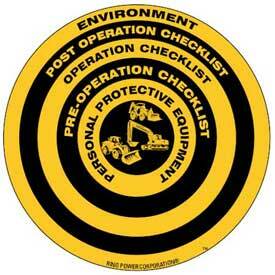 Our Rings of Safety program, relative to each piece of your equipment, reaps measurable financial dividends. The prevention/elimination of employee injuries and illnesses formulate an economic objective coupled with the humanitarian intention. Accidents, injuries, illnesses and property damage have undeniable costs that contribute nothing to the value of products and services provided by any firm. These costs, in many industries, dwarf the total profit picture and warrant direct attention and resource allocation to accident and loss prevention. Whether considering direct or indirect costs, everyone within an organization must be a crusader for controlling hazards and preventing accidents. In our efforts to assist you in putting safety first in your world, we will be featuring specific safety topics and provide additional resources in future issues of this newspaper. Protecting your people and reserving your profits is the safety business and that business is good business. Ring Power Corporation is pleased to announce their selection as the Florida distributor of Terex Utilities. Terex manufactures a broad range of equipment for use in various industries, including the construction, infrastructure, quarrying, mining, shipping, transportation, refining, and utility industries. Terex is focused on its mission of delivering products that are reliable and cost effective and producing equipment that improves its customers' return on invested capital. Terex has expanded dramatically in recent years seeking to expand the product offering, improve geographic coverage and deliver value for Terex customers. Kevin Robbins, Senior Vice-President of Ring Power stated, "The opportunity to partner with an industry leader like Terex Utilities allows us to continue bringing a well connected product portfolio to our customers in addition to realizing a great opportunity to expand our equipment offerings." "Ring Power is a great addition to the Terex Utilities distribution team. Through their operational footprint, they will be able to reach the entire utility market for equipment sales and rental, but most importantly provide aftermarket service on a local basis," said George Ellis, Vice-President/General Manager of Roadbuilding & Utilities for Terex.